This article was written by Ron Clifton for Bowling This Month Magazine and may not be copied or reproduced without written consent from Bowling This Month. Your geometry teacher was right: it takes two points to make a line. I remember my first day in geometry class back in high school and it would please my teacher, Mr. Alexander, to know that I can I recall something he said that day: “It takes two points to make a line.” I guess I’ve always known that, but I never really thought about it much until that day. Sometimes the simplest things can be the most important and that applies to bowling as well. I think most bowlers generally believe that they play some kind of line, but I don’t believe most bowlers take the term “line” literal enough. I believe you should play a well defined line when you bowl; the line you play should be made from two very distinct points, just as my geometry teacher once said. One point is located in the heads and the other point is at your breakpoint. When I say “breakpoint”, I am not referring to the time you left one too many ten-pins and threw all your balls in the river… or at least wanted to; no, I am talking about the spot down the lane where your ball starts hooking toward the pocket. Every bowler that throws a hook has a breakpoint and if you want to get really good at this sport, you must learn all about it. The subject of breakpoints has been addressed many times in the pages of BTM and I am sure that will continue for a long time. After all, identifying and using the breakpoint in bowling is still a fairly new concept. As I travel the country doing “Ron Clifton Advanced Bowler Training Clinics”, I find that very few bowlers have incorporated the use of the breakpoint into their games; even bowlers that bowl at the PBA regional level have failed to pick up on the importance of paying attention to their breakpoints and using them as part of a target line. In order to use the breakpoint in a targeting system you must first train your eyes where to look; this is not automatic believe me, you must work at it. 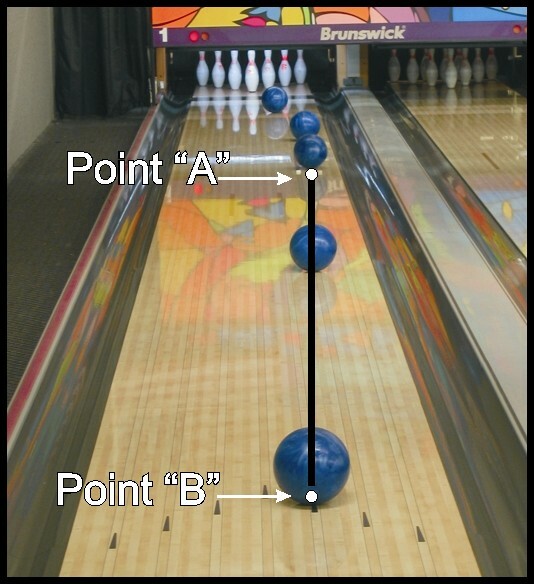 If there is a bowling center in your area that happens to have breakpoint markers pre-printed on the lanes like in photo #1, the learning process will go much easier, so practice on those lanes as much as you can. The pre-printed markers that are closest to the pins are located on the ten boards on ether side of the lane and start at 40 feet. Each marker is three feet long, even though they look much shorter than that from the foul line. The five boards on those lanes are outlined in black and the seven boards are a light color to help you pick out the individual boards. If there are no lanes in the area with the pre-printed breakpoint markers, ask your bowling center management for permission to add your own breakpoint markers by applying pieces of tape on the lane. Getting permission to do this is very tricky and the reaction from management will vary greatly from center to center. Tell them you would like to get the first or last lane in the house (first lane for left-handers and the last lane for right-handers) where there is usually a walkway beside the lane. Never walk on the lane or down the gutters and, for heavens sake, don’t be sticking your head or hands into the machinery. If the bowling center doesn’t like the idea of you being past the foul line, ask if they will have the lane man put the pieces of tape out for you. Please don’t forget to remove the tape before you leave. I always place my car keys on the floor beside the lane so I cannot leave without removing the tape. If you get the “OK” from center management, step off 40 feet from the foul line (or 20 feet from the head pin) and place one piece of tape on the ten board and one piece on the five board. In Photo #1, I sat tape boxes on the five and ten boards so they would show up well in the picture. This helps show how narrow the path is between the five and ten boards; when you get really accurate that will be plenty of room. The most accurate players on tour only need a couple of boards at their breakpoint and they will hit them eight out of ten times. Don’t worry about getting that 40 foot measurement exact; the goal is to just get something on the lane so you will have reference points from the foul line. Some synthetic lanes have all the boards the same color which makes it very hard to pick out your breakpoint; that’s why you have to work really hard to train your eyes where to look. Once the tape is in place, begin bowling your normal way, but pay close attention to the ball as it nears the pieces of tape. Try to train your eyes to judge how far down the lane 40 feet is and recognize what board your ball hits at the breakpoint; again, this is not easy and takes time and dedication to master. It is good practice to watch others bowl so you can identify their breakpoint as well as your own. It is actually much easier to pick out which board the ball hits at the breakpoint when you are not the one bowling. 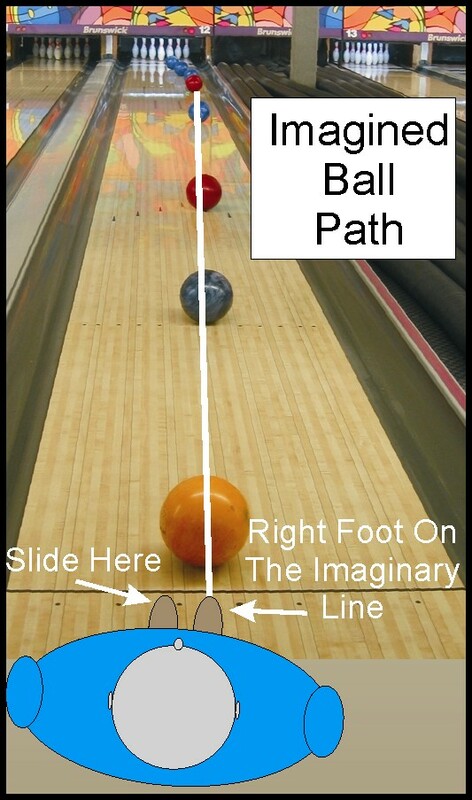 You will find that your breakpoint distance will be about the same everywhere you bowl. If there is an extremely short or long oil pattern, or if the oil has been mostly depleted, your distance will change a little, but in most cases, your ball's breakpoint will be within 2 or 3 feet of the 40 foot mark. I found it, what do I do with it ? First of all, as with everything in bowling, there is no one system that works for everyone on every lane condition; but you will find that on most lane conditions, to achieve your best carry percentage, you need to place your breakpoint between the five and ten boards ( with the seven board as the “sweet spot” ). This will give you a good angle of attack on the pocket and give your ball the best chance to deliver that high tech reaction you paid for. What’s so special about that part of the lane you may ask? Well, that “seven board” is outside what I call “the river of oil” found on most house shots. 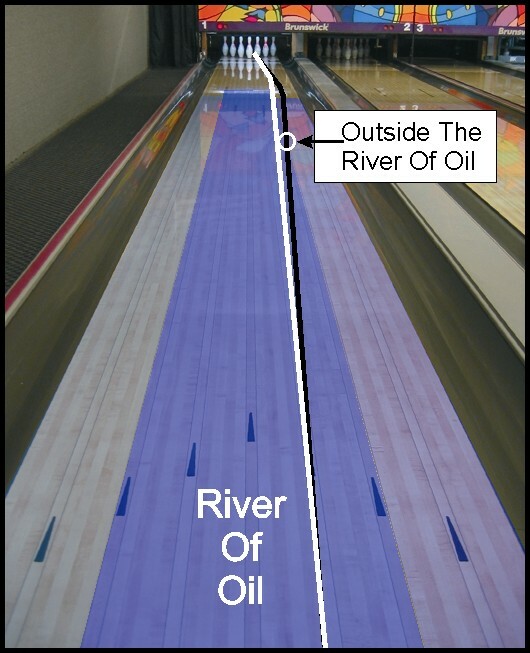 Most bowling centers place a much higher volume of oil between the two ten boards. Oil is a lubricant that makes balls skid; the more oil on the lane, the more the ball skids. The more the ball skids, the more speed it retains (can’t slow down as much due to friction) so a ball that stays in the “river of oil” is actually going faster at the breakpoint even though you threw the ball the same speed. A speedy, skidding ball can’t get traction with the lane surface and without that needed traction the ball can’t develop a good drive into the pocket. The bowler returns to his chair in disgust to exclaim the often heard “I can hit the pocket all day, but I just can’t carry in this house.” You see? To that bowler, all three of those balls looked and felt just alike. He saw each ball hit his third arrow target and he saw each ball enter the pocket. One ball got a strike and the other two balls…well, he got robbed in his mind. The truth is, the second and third balls never got outside “the river of oil” at the breakpoint, so they retained more speed and never got a good grip on the lane surface compared to the first ball. This caused the last two balls to deflect too much when they hit the head pin. The bowler never saw the misses at the breakpoint because he was not paying attention to that part of the lane. This means he was not actually playing a line… he was only playing the third arrow. Well, you can cross the third arrow in many directions because it is a single point (remember, it takes two points to make a line). When the lane man puts the “river of oil” out or the “league wall” as it is sometimes called; that makes it much easier to get the ball to the pocket but that does not guarantee that you will get a strike every time. The second and third shots thrown by the bowler in my scenario would go through the nose or cross over on a flatter oil pattern like they put out at the Nationals. Now that you have learned to watch your ball at the breakpoint, how do you use it in a targeting system? The first step is to pick your breakpoint. I divide the lane into three breakpoint zones. 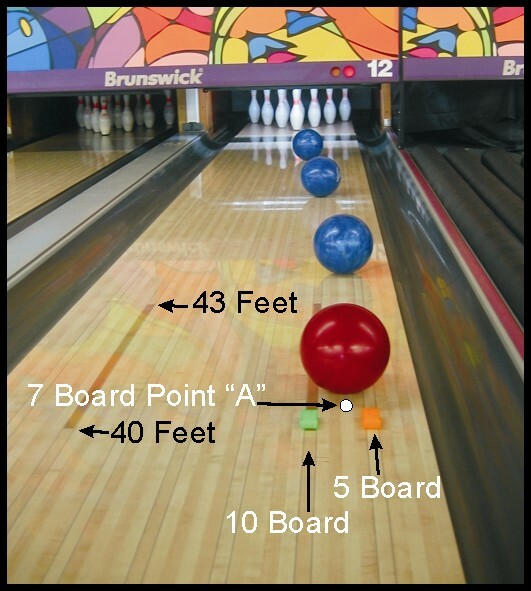 Zone #1 consists of boards one through five, so the ball would have to pass between the tape box sitting on the five board and the gutter in Photo #1. Zone #2 consists of boards six through nine; between the two tape boxes in Photo #1. Zone #3 consists of boards ten through fourteen so the ball would have to pass left of the tape box sitting on the ten board. Different oil patterns and lane conditions will call for different breakpoint zones; I will cover that more in a future article, but for now, I will use Zone #2 for this exercise because it will work well with the most oil patterns. The “sweet” board in Zone #2 is the seven board, so always target that as your breakpoint. This does not mean that you always have to hit the seven board, but I just like to use it as the point to complete the line. You may be able to strike if you hit anywhere within Zone #2, but that is determined by a lot of factors. The next step is to decide where you want the ball to cross at the arrows. This will be dictated by how much oil is in the heads and how much you hook the ball. If you throw the ball across the second arrow for example and the ball hooks before it gets to the breakpoint target, then you will have to move deeper and try again. For this example I am going to use the third arrow as the target board in the heads; this will be represented by “point B” in photo #3. Now you have two points; the seven board at 40 feet ( point “A” in photo #3 )and the third arrow in the heads; you have a well defined line to play. If you are right handed, stand at the foul line with both feet together with your right foot on the imaginary line and the toes of both feet pointing at the breakpoint. Now all you have to do is look down and see what board your left foot is on. That board is most likely the board you will need to slide on in order to deliver the ball down the imaginary line. Just figure in any drift pattern when you make your actual approach so you will end up on the correct board. Remember, you will also need to be facing your breakpoint when you get to the line as well in order for the ball to follow the target line. That’s the reason I had you point both toes at the breakpoint when standing at the foul line. Everyone has a different swing path and different walking patterns so you may have to make adjustments to fit your particular game. You now have two tasks to perform each time you throw the ball. The first task involves your physical game and being able to throw the ball down your imaginary line over and over again. After you have mastered playing a defined line, it will be much easier for you to read lanes and know right away if the condition has changed or if you threw a bad shot. You will also be forced to become more honest with yourself when bowling on easy lane conditions. Did you throw the ball well, hit your targets and earn the strike or was it a gift from the lane man? You will know the answer just about every time and if you advance to the PBA or some other higher form of competition the lane man will not so kind. The second task involves your mental game; you must pay attention to where the ball goes. Did the ball hit both targets? If not, where did it go? It seems that bowlers are willing to work for hours and hours on their physical game, but not as much on their mental game. When I use the phrase “mental game” in this and future articles, I am usually referring to the “smarts” side of bowling, not psychology; I will leave that to Dr. Hinitz. Your “smarts” is how well you pay attention, how much information you gather as the ball travels down the lane and what decisions you make based on that information. The “smarts” side of bowling, in my opinion, is the hardest part to learn and the hardest part to teach; but it separates the “goods” from the “greats”.